Paul Klee led an artistic life that spanned the 19th and 20th centuries, but he kept his aesthetic sensibility tuned to the future. Because of that, much of the Swiss-German Bauhaus-associated painter's work, which at its most distinctive defines its own category of abstraction, still exudes a vitality today. And he left behind not just those 9,000 pieces of art (not counting the hand puppets he made for his son), but plenty of writings as well, the best known of which came out in English as Paul Klee Notebooks, two volumes (The Thinking Eye and The Nature of Nature) collecting the artist's essays on modern art and the lectures he gave at the Bauhaus schools in the 1920s. "These works are considered so important for understanding modern art that they are compared to the importance that Leonardo’s A Treatise on Painting had for Renaissance," says Monoskop. 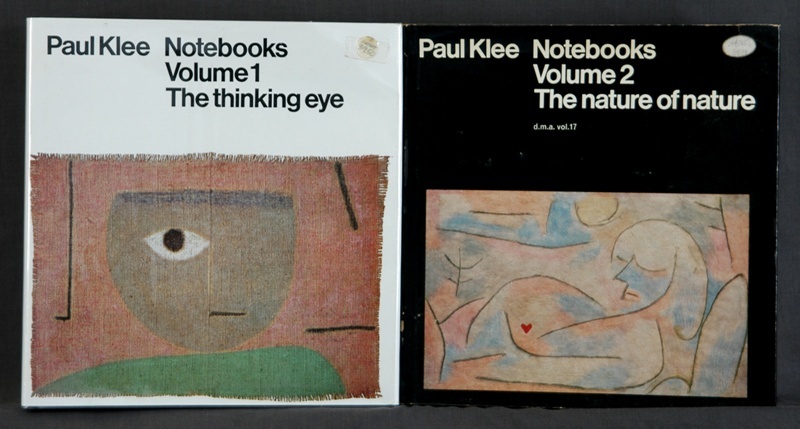 Their description also quotes critic Herbert Read, who described the books as "the most complete presentation of the principles of design ever made by a modern artist – it constitutes the Principia Aesthetica of a new era of art, in which Klee occupies a position comparable to Newton’s in the realm of physics." 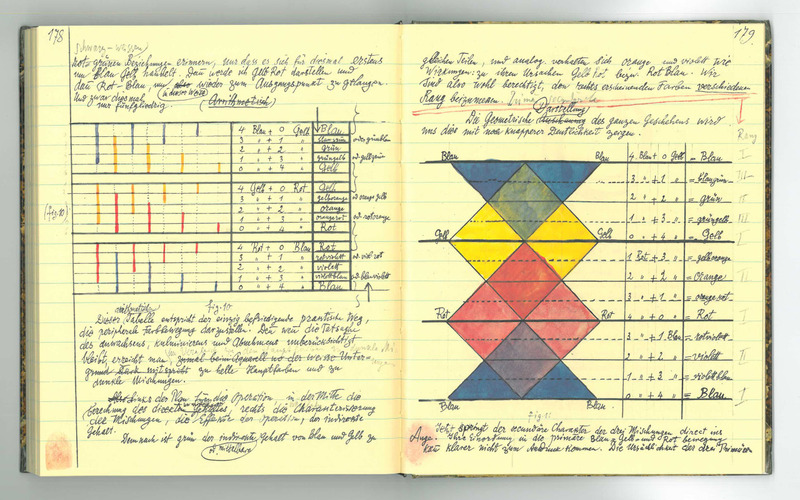 More recently, the Zentrum Paul Klee made available online almost all 3,900 pages of Klee's personal notebooks, which he used as the source for his Bauhaus teaching between 1921 and 1931. 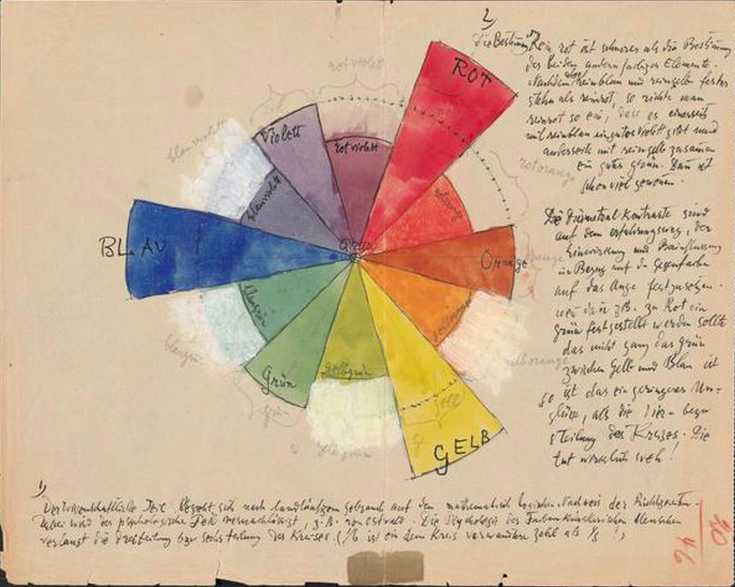 If you can't read German, his extensively detailed textual theorizing on the mechanics of art (especially the use of color, with which he struggled before returning from a 1914 trip to Tunisia declaring, "Color and I are one. I am a painter") may not immediately resonate with you. But his copious illustrations of all these observations and principles, in their vividness, clarity, and reflection of a truly active mind, can still captivate anybody — just as his paintings do. uh… its in black and white… ? Where are the color versions? This was posted at Monoskop in 2013, as the link given at the posting itself obviously shows. What’s the point of calling this “now online”? For myself and many of my artist friends we are happy this has been shown as we have never seen it. Think before you criticize! The point is you are simply wrong in calling this “now online”. This a fact, facts must be accurately described. If you showcase stuff that are online for months or years, give the correct facts and everything is fine. Geez lighten up! Everything is fine anyway! About “If you can’t read German, his extensively detailed textual theorizing on the mechanics of art (…) may not immediately resonate with you”: actually, you can still get a Google or Bing translation of the text part. True, the pages themselves of these online Classotes are made of a single image containing both the facsimile and its transcript, so Google or Bing cannot translate the transcript part. However, the menu that opens from the printer’s icon offers four options, of which two have “Transkription” in their names, and are PDFs where the transcript is in real, translatable text. So you can copy the URL of one of these two PDFs and paste it in a either Bing or Google translate. The resulting machine translation is imperfect, but good enough to decide if you can still make better sense yourself or ask someone who knows German for further help. Thank you for such overwhelming treasure box. I come here very often and wanted to ask a favor: Could you make your links open in a new window or pop-up? That way we can have many windows open without loosing the source. It would come very handy for navigation within the site. Thank you again for your beautiful collector’s eye. j’aurais voulu partager sur Facebook ! Grâce à vous, cela est devenu possible, grand merci. Yes, you can tell from all the color pictures. Thanks for presenting the info on Klee. it has to be as important for future artists academics and officionados as the revelations found in the dead sea scrolls are to theologists and the forge of history. qualche suggerimento per scaricare questi preziosi appunti? Érdekel a modern művészet. Örültem az információknak. Great event, but it doesn’t seem to work on a Macintosh OS. Anyone have a workaround for this?